Hello! 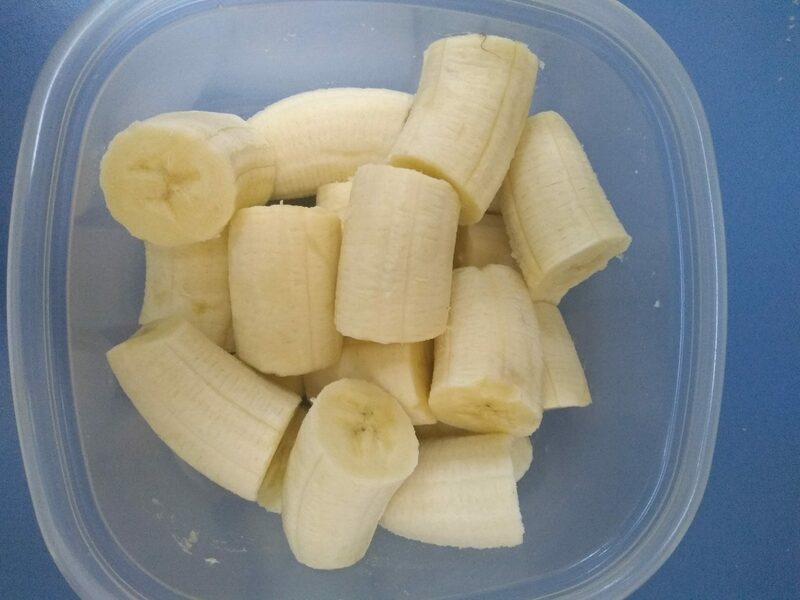 I’m coming out of blog hibernation because as I was cutting up bananas to freeze the other day, it occurred to me that sharing my method might be helpful. 🙂 I’ve been doing this for years and years, and not only does it save us money, it results in pretty, uniform chunks that can be easily thrown into a smoothie, or thawed for baking. It takes a few extra minutes at the beginning, but will save you much more time when you take them out! Has anyone else ever struggled to get the peel off a frozen banana? I have, and it is waaaay more work than peeling at the outset. Step 1: Allow your bananas to fully ripen, or better yet, buy a bunch of reduced price, overripe bananas at the store! Step 2: Peel your bananas. I cannot emphasize this enough! Peels come right off a room-temperature banana, but they stick like superglue when they are frozen. Use a sharp knife to cut off any bad spots (or not…but I do this because I’m just fussy that way). Step 3: Cut each banana into quarters. This will help when you are ready to use them. If you normally throw one banana into your smoothie, use 4 chunks. If your banana bread recipe calls for 3 bananas, use 12 chunks. You get the idea. I promise, your bananas will be appealing to use! If the chunks stick together, you should be able to pry them apart easily with a table knife. Never again worry about buying too many bananas – if they all ripen at once, just freeze what you aren’t ready to eat. Before we leave for vacation, I often freeze a giant container of these. Add your bananas to smoothies or protein shakes, or make banana soft-serve ice cream! Or thaw and bake into bread or other recipes, like the Banana Oat Bundles from Dreena Burton’s Vive Le Vegan! What’s your favorite way to use frozen bananas?